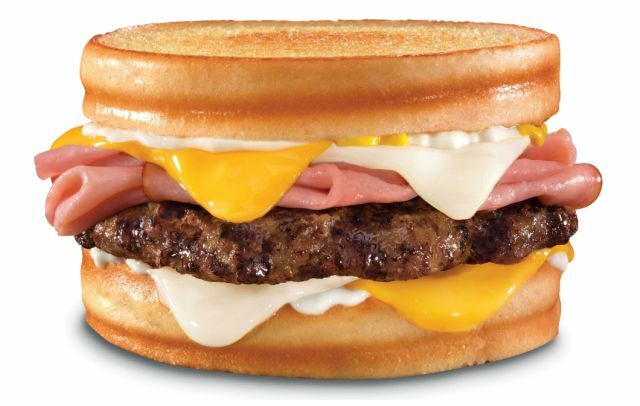 Hardee's combines a hamburger with a grilled ham and cheese sandwich for the new Grilled Ham 'N' Cheese Thickburger. Available for a limited time at participating restaurants, the burger features four slices of American and Swiss cheese, thin-sliced ham, a Black Angus beef patty, mayo, and mustard between two slice of grilled bread. It's essentially the lunch and dinner version of their Grilled Cheese Breakfast Sandwich. The Grilled Ham 'N' Cheese Thickburger is available with varying beef patty sizes ranging from a 1/4 to 1/2 a pound with prices starting at $3.79 (may vary). You can also get one as part of a combo that includes fries and a drink starting at $5.79.